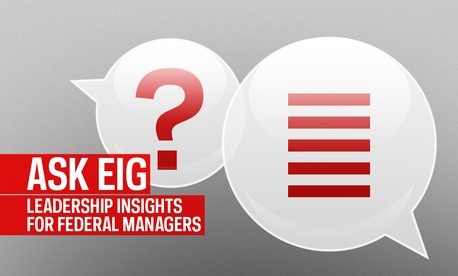 Ask EIG is your chance to seek answers to public sector management challenges and conundrums. No question is too big or small, complex or simple. Submit your questions at AskEIG@govexec.com. My agency is experiencing new senior leadership due to the recent election, and I sense concern among existing management that our existing plans will not be followed by the new senior leadership. How can we better prepare for senior leadership planning changes without negatively disrupting our existing plans and momentum? Changing leadership at the top of any organization, especially at a government agency, can pose great challenges for ongoing initiatives and organizational change efforts that are underway. A new leader, even if appointed by the same president that appointed the prior one, may see things differently from their predecessor. The president’s agenda or priorities may have changed. The political landscape may have shifted requiring a different direction. The new leader’s preferences and personal objectives may be very different from the prior leader’s agenda. For managers as well as the America people, such shifts in focus can be costly if not disastrous. Not liking what they see, a new leader might shift course and stop or cancel initiatives and projects already underway. To be clear, ending some of these activities might be the right thing to do if the leader’s expectation is that they will not deliver the promised value. Yet for other initiatives and projects—those that are likely to deliver enough value—terminating these activities can create a kind of scorched earth. Months and years of work can disappear into smoke and ashes. The investments—sometimes totaling tens and even hundreds of millions of dollars—sunk into planting and growing a new forest of capabilities are burned through with no return. And, organizational morale can collapse like a charred log into a pile of embers too hot to approach but nonetheless smoldering, waiting to start a blaze if fresh fuel is added from above. How can your management avoid such negative consequences? How can you make a case for sustaining momentum while simultaneously building trust and understanding so that the leader comes to rely on you and your management team? All too often managers try to sell a solution (i.e., the initiatives and projects underway) by dressing them up to look like what they think the new leader might want. Maybe this kind of selling can work; but, I suspect that it doesn’t work very often. New leaders can see through smoke screens or, at least, are suspicious of them. If so, the leader evaluates the solutions based on how they perceive value and what problem they infer management is solving. The net result is that management’s pitch easily can strike out. In baseball as with engaging any new leader, I can’t guarantee that you will get a homerun, let alone a hit, every time. Nonetheless, five steps may increase the likelihood that you can get on base and keep your initiatives and projects moving ahead. Share all related symptoms: Start by sharing with the new leader all of the symptoms and indicators that launched the issue in the first place. Without understanding the original symptoms and indicators of pain, it will be difficult for any leader, especially a new one, to understand the problem being solved or to assess the value a solution can create. Comprehensively formulate the challenge: Help your new leader understand how the challenge was formulated. What are all the root causes and how are these causes generating the observed symptoms and indicators? Without understanding all of the root causes it becomes easy to adopt a simplistic view of the challenge and an incomplete understanding of what needs to be done. Assess the value created if a solution can be found: Work with your new leader to assess the value that can be created if a feasible solution can be found. Doing so provides a basis for assessing not only the value of each solution but also which one offers a better approach. Without first establishing how much value can be created, every solution looks expensive. Compare solution approaches: Wise leaders always compare the best alternatives they can develop before making a decision. By sharing with your new leader the alternatives considered and how they stack up against the root causes and their respective costs, the leader will come to appreciate why you chose a particular solution approach. Outline implementation details: Finally, share the implementation details for the chosen solution approach. Not only describe how you will achieve the promised upside value but also please pay special attention to explain how you have taken steps to mitigate the downside possibilities. Building trust and creating understanding with a new leader is not easy. Using these five steps creates an additional challenge because communicating them takes time and represents an unfamiliar sequence—new leaders may ask “tell me what you are doing, not what problems you are solving”. That said, if a new leader understands the challenge and the value that can be created then they will have the best available information and knowledge with which to make an informed decision about the solution implementation underway. With a new communication approach and little luck, you may be able to increase your batting average on maintaining existing plans and momentum. In partnership with Brookings Executive Education, Excellence in Government is now taking, and answering, your most difficult management questions. Send your questions to AskEIG@govexec.com. Previous Post | The Secret to Productivity: Cute Videos of Kitties?